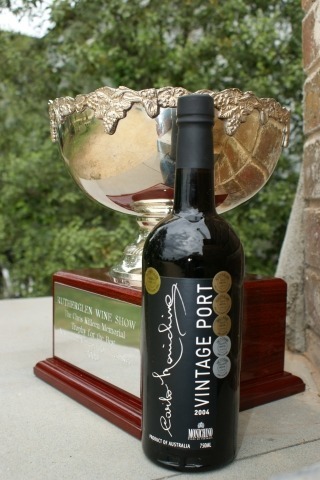 Awarded ‘Best Australian Vintage Fortified Wine’ at Rutherglen Wine Show 2008. 3 Gold Medals at Small Winemakers & Victorian Wine Show. Carlo and Terry are the winemakers for this sensational wine. The grapes are 100% grown on the Monichino Katunga Estate. To intensify flavour and colour, the vines were stressed from fruit set, and picked without any supplementary water. This wine can be consumed young but is best after many years of bottle age. Ideal cellaring conditions are in a cool (12-14 degree celsius) dark environment and laying down to keep cork moist. Cellaring potential of 15-20 years.